Victoria, Saanich and Oak Bay lie in one of the most seismically active regions of Canada. In fact, a major earthquake could occur at anytime. Depending on the magnitude of the earthquake we could be in for some surprising damage to our city. During an earthquake, heavy gas and electric water heaters can shake and topple, causing extensive damage to your home or property and even cause natural gas to leak into your home, leading a potential fire or explosion. Because of this hazard the BC building and plumbing codes require that ALL electric and gas hot water heaters be strapped or restrained in our seismically active zone (Victoria, Saanich, Oak Bay and Peninsula). 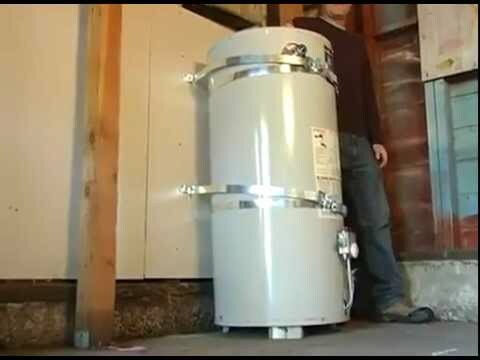 Make your water heater earthquake earthquake ready in Victoria, Saanich, and Oak Bay by calling Garden City Plumbing Ltd. and have our plumbers install earthquake strapping or seismic restraints to secure your water heater. Get all people and pets out of the house. Call your natural gas utility FortisBC at 1-800-663-9911 , 911, or fire department emergency number using a cell phone or from a neighbour's house. Turn off your gas meter if you know how. Keep a shut off wrench chained to the gas meter for such an emergency. A methane / natural gas detector can be installed to tell if gas begins escaping after an earthquake. These are to be used along with a CO (carbon monoxide) detector.